Allow me to share with you an upcoming exhibition featuring the artworks of Eric Briscoe, Coordinator of the Visual Arts Major at Morgan State University. The title of the exhibition is: Nontoxic Masculinity. 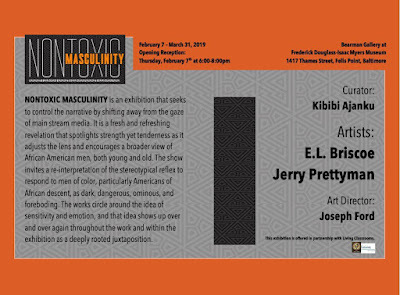 The exhibit will be shown from February 7- March 31, 2019 at the Frederick Douglass-Isaac Myers Museum in the Bearman Gallery at 1417 Thames Street in Fells Point. If you get a chance, try to make it out to the opening reception on Thursday, February 7, 2019 from 6-8 PM to see his works of art.